The Berber languages, along with old Egyptian and the Chadic, Cushitic, Semitic as well as Omotic languages, belong to the phylum of Afro-Asiatic languages. 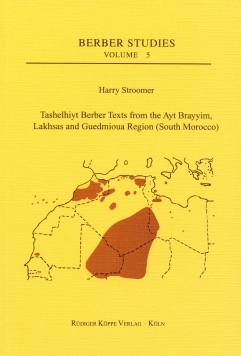 Nowadays, Berber languages are found from Egypt (Siwa) across Libya and Algeria to Morocco and from the shores of the Mediterranean Sea to south of the Sahara. 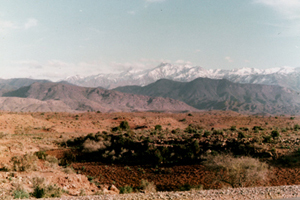 Tashelhiyt is the largest single Berber language spoken by about 6 to 8 million people, predominantly in South Morocco. The texts given in the present book were collected by Arsène Roux (1893–1971) among the Ayt Brayyim and the Lakhsas, situated south of Agadir in the Tiznit area, and the Guedmioua, living on the northern slopes of the High Atlas, south of Marrakech. They cover several genres, e.g. riddles, proverbs, religious legends, fables and tales. Roux was an accomplished specialist of Middle Atlas Berber and Tashelhiyt Berber during the Protectorate period (1912–1956) and founder and director of the Collège berbère d’Azrou. He published this collection in 1942 as a reader for his courses teaching Tashelhiyt Berber to French citizens and military personnel. Whereas Roux had been content to offer only a broad phonetic transcription, the present author improves on his work in providing a phonological-morphological retranscription from Roux’ original copy of the Récits and adding a complete English translation. The stories are presented synoptically, with the original Tashelhiyt Berber facing the English text. The author aims to reveal more of the grammatical structure of the Tashelhiyt Berber language and to provide students of Tashelhiyt Berber with an accurately transcribed collection of texts that can be used for linguistic analysis.